Tons of news today, mostly good news for George Bush. 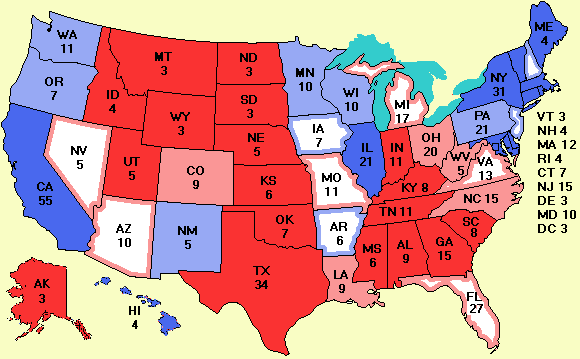 There were a total of 17 new polls released today, mostly Zogby Interactive polls, and Bush has picked up Florida, Ohio, Nevada, Wisconsin, and West Virginia, while losing Arkansas, Wisconsin, and New Mexico. New Hampshire had a new poll and is no longer tied, so the electoral votes add up to 538 again. But the bottom line is that Bush is now slightly ahead. It is hard to believe that Arkansas is now slightly for Kerry, but that is what the Zogby poll showed. Maybe they are remembering favorite son Clinton with nostalgia. Once again, everyone is reminded of the statement former British Prime Minister Benjamin Disraeli made: "In politics, a week is a long time."